One of the things that almost all games have in common is a loading screen, which can be used to inform the player how long they must wait to play the game. Even though no one likes waiting to play a game, a loading screen is a valuable tool. Instead of having players stare at a blank screen, the loading screen can be used to inform the player how much longer they have to wait, or at minimum let the player know the game is doing something. In Phaser, before you can use any assets, you must first load them in preload function of the scene. If you load a large number of assets, it can take some time for all of the assets to be loaded into the game, and this is where a preloader really makes a difference. In order to run your Phaser game locally, you will need a web server for running your game. If you don’t already have this setup, you can read how to do that here: Getting Start With Phaser. You will also need an IDE or Text Editor for writing your code. If you don’t already have one, I would recommend the Brackets editor since it is easy to use, and it has a feature called Live Preview that will allow you to run your Phaser game without installing a web server. We created the configuration that will be used for our Phaser game. In the config object, in the type field, we set the renderer type for our game. The two main types are Canvas and WebGL. WebGL is a faster renderer and has better performance, but not all browsers support it. By choosing AUTO for the type, Phaser will use WebGL if it is available, otherwise it will use Canvas. In the config object, the parent field is used to tell Phaser to render our game in an existing <canvas> element with that id if it exists. If it does not exists, then Phaser will create a <canvas> element for us. In the config object, we specify the width and height of the viewable area of our game. In the config object, we embedded a scene object which will use the preload and create functions we defined. Lastly, we passed our config object to Phaser when we created the new game instance. If you try running your game, you should see a black screen, and if you open the console in the developer tools, you should see a log with the version of Phaser your game is running. Now that our project is setup, we can get started. Before we can create our preloader, we will need to load some assets into our game. To keep things simple, we are going to use one image and reload it a few times to simulate loading a large number of assets. The asset for the game can be downloaded here. You will need to place the image in same folder as index.html. If you reload your game in the browser, you should see the logo appear in your game. This code creates a few event listeners that will listen for the progress, fileprogress, and complete events that are emitted from Phaser’s LoaderPlugin. The progress and fileprogress events will be emitted every time a file has been loaded, and the complete event will only be emitted once all the files are done loading. When the progress event is emitted, you will also receive a value between 0 and 1, which can be used track the overall progress of the loading process. When the fileprogress event is emitted, you will also receive an object containing information on the file that was just loaded. Both of these can be used to create custom preloader with the information that is provided. In the code above, we are creating two separate rectangles, progressBar and progressBox. The progressBox rectangle is going to be used as a border/container around the progressBar, and the progressBar will be used to track the overall percentage of the assets being loaded. We are doing this by calculating the width of the rectangle to be based on the progress value we are receiving. So, every time we receive the progress event, we should see the rectangle grow. If you reload the game, you should see a nice progress bar that fills up as the assets are being loaded. However, there is one problem with it. 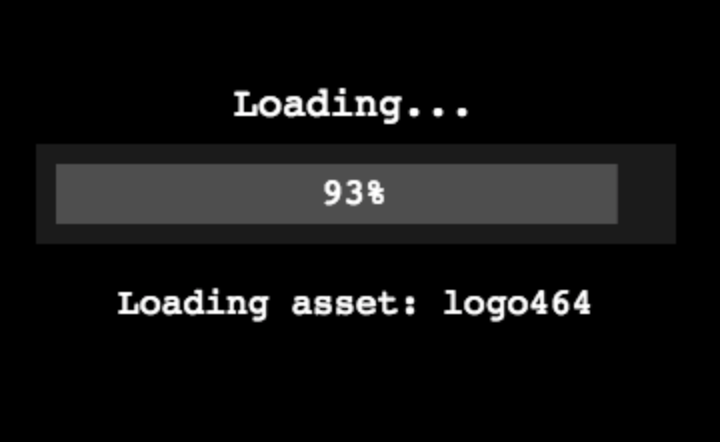 When the all of the assets are loaded, the preloader is staying on the screen, and the logo image is being loaded over top of it. To fix this, we can update the complete event listener to destroy our preloader once all assets are loaded. Now, if you reload your game, the progress bar should disappear before the logo image is displayed on the screen. We created two new variables, width and height. These variables are getting the width and height of the current viewable area of our game. We created a new Phaser Text GameObject called loadingText. This game object is using the width and height variables we just created, and we set the style and default text of the game object. We set the origin of the game object to be (0.5, 0.5), which will help center our game object. Lastly, we updated the complete event listener to destroy our loading text once all the games assets were loaded. Created a new Phaser Text GameObject called percentText. We set the origin to (0.5, 0.5) to help center the object. In the progress event listener, we are updating the text of the object, every time a file is loaded. We are multiplying the value by 100 since the value that is emitted is between 0 and 1. Lastly, we updated the complete event listener to destroy the object. If you reload your game, you should see the progress bar percentage update as the progress bar fills up. Now, if you reload your game, you should see the asset text being updated as each asset is loaded. You can download the completed example here . With the asset text now being displayed, this brings this tutorial to a close. As you can see, adding a preloader to your game is a great solution when you will be loading a large number of assets, and you want to keep the players informed of the games current state. With Phaser, it is really easy to add a simple preloader and you can easily extend these examples to create a more complex preloader. A good and simple tutorial! Can you make a tutorial on creating a Main Menu after the progressbar is finished? Thanks SaikaVA! Thanks for the suggestion on making a tutorial about creating a Main Menu. Once I wrap up the other tutorials I am working on, I will see what I can do. this code example seems to be really good for learner. Hi Gustav. In the preload function, when you load the image, are you doing more than one copy of it? If not, then the game could be loading fast enough that the preloader would not show. If not, when you run your code if you open up the developer tools and go to the console (in Chrome you can use Ctrl+Shift+J (or Cmd+Opt+J on Mac)), does it show any errors? If not, can you please share your code? Just a little question, why are you using “cameras” (this.cameras) instead of grabbing width and height from “sys” (this.sys.game.config….) ? How can load outside preload funtion? How do you load your assets synchronously from an object WITHOUT using a for or while loop? I need it to be reliable, stable and fast.